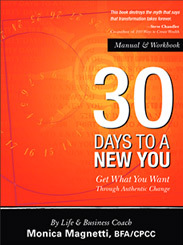 30 Days to a New You by life coaching author Monica Magnetti isn’t just a self-empowerment book for entrepreneurs. 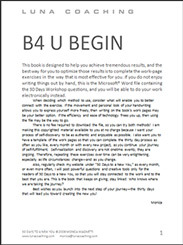 It’s also a manual designed especially for entrepreneurs, written in conversational style, with an easy-to-read font and eye-catching graphics. Daily questions and exercises are thought-provoking and practical, organized simply and systematically on spacious workbook-style pages. Additional pages, with a summary chart, are available as a free download (click on the appropriate box below). This book will take you far beyond the first 30 days. It can be reused many times, with each major project and goal. 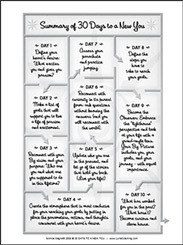 In 30 Days to a New You, life coaching author Monica Magnetti doesn’t give advice. Instead, she offers self-empowerment to entrepreneurs. Acclaimed as a wellness coaching book, a career coaching book and a self-empowerment book for entrepreneurs, it helps readers find their own answers to life’s big questions while staying true to their own values. A life lived authentically, purposefully and intentionally is proving to be the only powerful way to navigate our rapidly changing world.